What Are Dominant 13 Arpeggios? 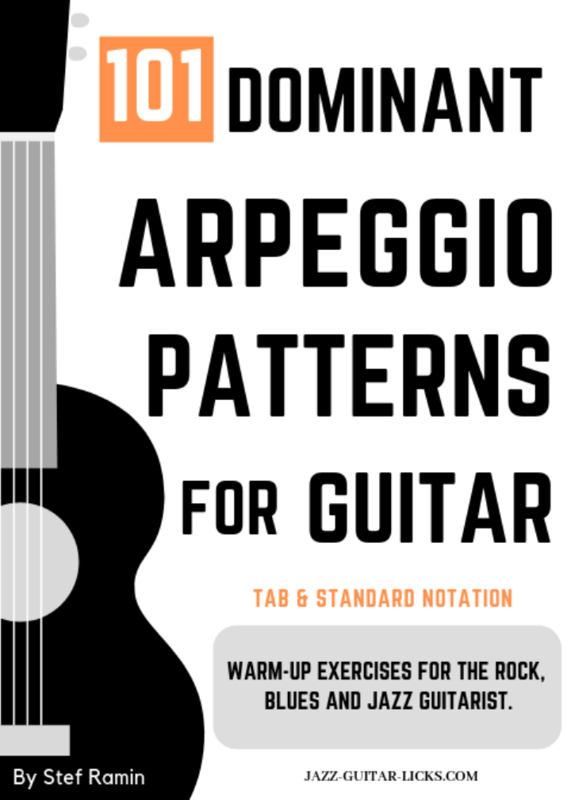 Dominant 13 arpeggios are built with seven notes. These are dominant seventh arpeggios with three supplementary notes considered as extensions. These notes are the ninth (9), the eleventh (11) and the thirteenth (13) giving the dom13 formula 1 (root) - 3 (third) - 5 (fifth) - b7 (minor seventh) - 9 (ninth) - 11 (eleventh) - 13 (thirteenth). a m7b5 arpeggio (1-b3-b5-b7) starting on the third (B). a minor 7 arp (1-b3-5-b7) starting on the fifth (D). a maj7 arp (1-3-5-7) starting on the seventh (F). In other words, over G7 you can play Bm7b5, Dm7 or Fmaj7. Bm7b5 will highlight the ninth of G.
Dm7 will highlight the ninth and the eleventh of G.
Fmaj7 will highlight the ninth, eleventh and thirteenth. The two diagrams show how to play dominant 13 arpeggios on guitar. The first have the lowest root on the sixth string whereas the second shape have the lowest root on the fifth string. Here are some dominant 13 chord shapes. The idea behind is to play a dom13 arpeggio and the corresponding chord. For example with these two easy exercises. The arpeggio shapes 1 and 2 previously seen are connected with two 13 chords (G13 and C13). Try to create you own exercises mixing arpeggios and chords.